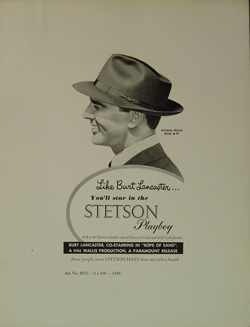 Many years ago, when every man and woman wore a hat, professional care and maintenance of your hat(s) was considered the norm and necessary to look proper. Each season, the well dressed person would bring any of their hats that were not quite looking up to par to their hatmaker for renewal. Hat makers were not uncommon then and the maintenance of hats was a substantial part of the hatmakers routine. Whether you have a Panama hat, Straw or other fibre hat, felted hat of wool or fur; your hat can benefit from some professional TLC. The Hat House in Soho can do the necessary hat repairs, hat cleaning, reshaping/blocking and hat maintenance to bring many of your hats back to their prior glory. We do not work with harsh acids, fumes or dangerous chemicals and solvents here in our Soho Hat Shop in New York City , although we can still get excellent results from our proprietary methods. It amazes me that the hatters of the turn of the century and even later were using some of the scariest chemicals to clean, bleach and resize hats. 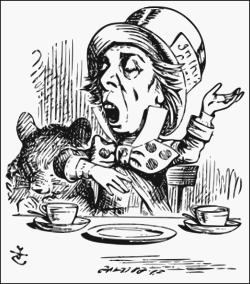 I am sure you have heard of the Mad Hatter and the mercury that was used (and the ailments that followed). Toxic mercury is just one of the crazy and dangerous chemicals that was used to work with hats, in addition the hatters of yore used salts of lead and other heavy metals in their hat work. Gasoline was used liberally, yes, gasoline as a cleaner and a litany of other carcinogenic chemicals. I am sure that most of the work with chemicals was done with bare hands! Again, we do not use any of those dangerous things on your hat. Of course there are some hats that do require certain harsh chemicals; if that is the case, we can have it done for you by our outside hat technicians that work in a safe environment and no heavy metals are used. No, the hat technicians I use are not mad...just certifiably crazy. Tears in fine Panama hats and holes in the peaks of hats can many times be totally fixed or remediated as well as replacement of hat bands, liners, sweatbands as needed. We also can provide a nice selection of pheasant and guinea feathers to grace your hat if you desire. By the way, if your hat is too big or too small, it may be possible to resize the hat to fit you better. This again is on a case by case basis, so bring your hat in to our hat store in New York City. If you have a good hat, it can be worth putting some maintenance into keeping it alive, well and great looking again! Our fees are reasonable and based upon the hat and the work required.